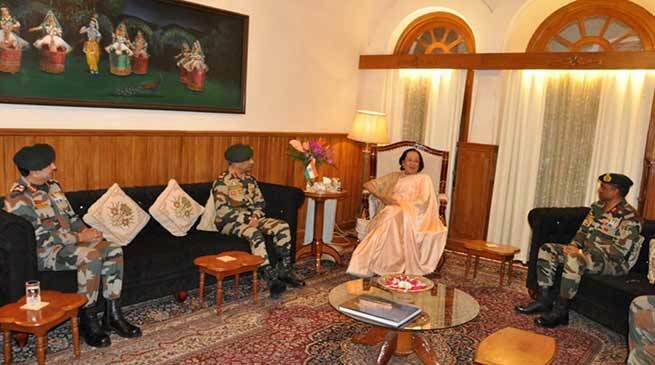 Army Commander also interacted with the Chief Minister, N Biren Singh and discussed the security situation in Manipur. Lieutenant General MM Naravane, Eastern Army Commander, met the Governor Dr. Najma Heptulla at Raj Bhavan on 22 January 2019. He was accompanied by Lieutenant General Rajeev Sirohi, General Officer Commanding, Spear Corps and Major General KP Singh, IG Assam Rifles (South). The Army Commander apprised the Governor of the actions being taken by the Indian Army and Assam Rifles in coordination with other agencies, towards maintenance of peace and security in the state. The Governor lauded the untiring efforts of the forces in difficult conditions and complimented them for carrying out people friendly operations. Later in the day, the Army Commander also interacted with the Chief Minister, N Biren Singh and discussed the security situation in Manipur.